WhenToHelp provides a method for coordinators to send out an urgent text message alert to helpers' and coordinators' cell phones or email. Each helper and coordinator must sign in and set which email or text message address will receive these alerts (or the coordinator can set this up for helpers). 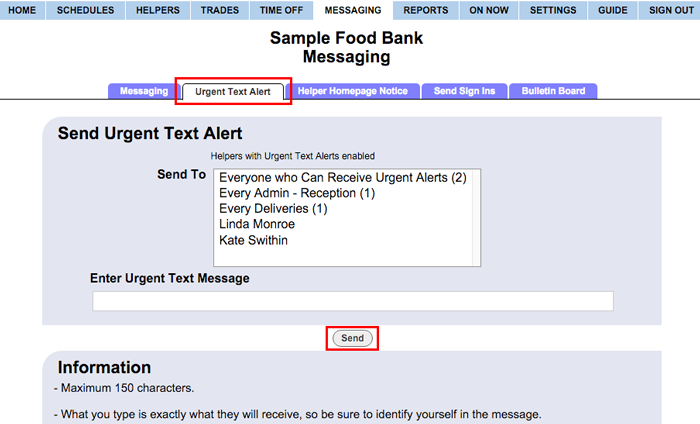 Hover over MESSAGING in the top menu and choose Send Urgent Text Alert. Click the Send button and the alert is sent to all users who have chosen to receive them. If you do not see the checkbox to send a copy to yourself, be sure that you have set up your email and/or text address notifications to include Urgent Text Alerts on your Settings>My Notices page.